Thursday saw the launch of the Toronto After Dark Film Festival, now celebrating its tenth year of highlighting the latest in cinematic genre fare. And if the filled-to-capacity gathering for last night’s opening gala is any indication, it looks like this might be one of their biggest years yet. As such, it couldn’t be more fitting that the opening gala of this October institution was custom made for this holiday season. 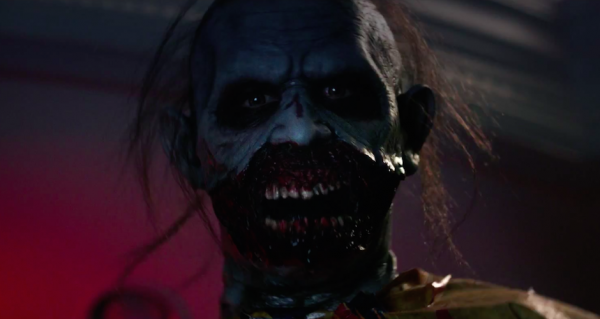 I’m talking about the Halloween-themed anthology, TALES OF HALLOWEEN. A loosely-connected (and I mean by the slimmest of threads) collection of stories set on one Halloween night, TALES was concocted by the filmmakers’ collective, deliciously dubbed The October Society, and spearheaded by producers/directors Mike Mendez and Axelle Carolyn. Now, I feel it’s important to get this out of the way: there will be inevitable comparisons to Mike Dougherty‘s now-seasonal-perennial TRICK ‘R TREAT. Yes, both are anthologies set during All Hallows’ Eve, but that’s as far as the comparison goes. Whereas TRICK was a singular vision connected through multiple plotlines written and directed by Dougherty, TALES has ten separate tales from ten different filmmakers, each one different in tone and style from each other, resulting in a much more eclectic mix. The story parameters given to each director were simple and open-ended: one Halloween night in the suburbs, bad things happen. TRICK (Adam Gierasch): two young couples are menaced by a gang of murderous trick-or-treaters. Clever, brutal with a sick and vicious punchline. BAD SEED (Neil Marshall): A killer jack-o-lantern runs amuck, and it’s up to one tough cop to put an end to its rampage. What makes it work is how Marshall plays out this goofy concept with po-faced 80s B-movie straightness. GRIMM GRINNING GHOST (Axelle Carolyn): a pitch-perfect campfire ghost story. As an aside, Carolyn excels at this kind of slow-burn creepshow (watch her film, SOULMATE, to see what I mean) and GHOST mines a lot of tension in its short running time, ending with a satisfying (and spooky) payoff. FRIDAY THE 31st (Mike Mendez): A flat-out gonzo slasher parody that evokes the early gore-splattered films of Sam Raimi and Peter Jackson. One of the big crowd-pleasers with the After Dark audience, and with good reason. It’s bloody hilarious. THE RANSOM OF RUSTY REX (Ryan Schifrin): a kidnapped trick-or-treater who’s not what he appears to be proves to be an unholy handful for his two kidnappers. A clever concept loosely based on the O. Henry story “The Ransom of Red Chief”, bolstered by the performances of Sam Witwer, Jose Cantillo and John Landis. Another winner with the opening night crowd. THE WEAK AND THE WICKED (Paul Solet): This one’s a little tougher to nail down. I’m going to call it an “urban supernatural western”. With teenagers. The real “wild card” of the bunch and, letting it stew since first seeing it, it’s becoming one of my favourites of the ten. Which brings us to the film’s cast. Did I mention the cast? Because Sweet Baby Jeezus … it’s a who’s who of cult and genre cinema history including… *deep breath*… Barry Bostwick, Lin Shaye, Dana Gould, Tiffany Shepis, John Savage, Caroline Williams, Robert Rusler, Joe Dante, Adam Green, Adam Pascal, Mick Garris, Stuart Gordon, Barbara Crampton and Adrienne Barbeau. And that’s just for starters. Like I said, anthologies are a hit-and-miss kind of deal. Some stories stick it on the landing, some never get their footing. But with ten short blasts of horror crammed into ninety-or-so minutes, there’s bound to be something here for a wide array of tastes and preferences. Above all that, though, you can feel the love that went into making TALES (trite, I know, but hear me out). The cast of genre luminaries, the EC Comics vibe and the old-school practical effects make it more than just a fitting tribute to Halloween, but a love letter to (and from) the generation of monster kids – my generation -who grew up reading Fangoria and gathering with like-minded individuals for VHS-fueled horror movie marathons. It’s also just a lot of fun. Probably the most fun I’ve had with a horror anthology since my young and unsullied eyes first took in CREEPSHOW all those years ago. So here’s hoping this “October Society” thing becomes an annual deal. Because I would gladly support that. TALES OF HALLOWEEN is now available for your seasonal viewing on VOD, including iTunes. NEXT TIME: A one-two shot of After Dark fare, with A CHRISTMAS HORROR STORY and THE HALLOW.